Donna Handley, Senior Vice President of the Hartford HealthCare Cancer Institute, speaks at the announcement of the MSK Cancer Alliance. Hartford Healthcare system in Connecticut has been selected as the first MSK Cancer Alliance member, established to enhance delivery of care, improve patient outcomes, and advance research. Memorial Sloan Kettering today launched a transformative initiative to improve the quality of cancer care and the lives of cancer patients. Hartford HealthCare (HHC), a multihospital healthcare system in Connecticut, was selected as a pioneering member of the newly formed Memorial Sloan Kettering Cancer Alliance. The joint announcement, made in Hartford by leaders of the two organizations, comes after year-long discussions resulting in a distinctive clinical and research partnership built to rapidly move innovative, evidence-based cancer care into the community setting and enable bi-directional learning across the institutions. The MSK Cancer Alliance is designed to enable an ongoing, “living, breathing” dynamic partnership between the comprehensive cancer center and community oncology providers, in order to bring the newest knowledge into the community setting. “Currently, the vast majority of cancer care in the United States is delivered by community oncologists, but cancer advances can take years to be adopted in a community setting,” said José Baselga, Physician-in-Chief of Memorial Hospital, who notes that ongoing, interactive real-time relationships are needed to effectively close this gap. “We want to rapidly accelerate the pace of integrating the latest advances of cancer care into a community setting. This unprecedented approach will demonstrate real value to both organizations and most importantly will improve the lives of cancer patients,” he added. Among the many distinctive aspects of the collaboration is the establishment of the first MSK Alliance clinical trials site at Hartford Hospital, where many of the cancer clinical trials from Memorial Sloan Kettering’s robust portfolio will be provided on-site. This will dramatically improve patient access to the latest cancer advances and breakthroughs. Memorial Sloan Kettering physicians and leadership will now be collaboratively guiding HHC toward excellence in both its cancer care and clinical research programs. This will be achieved, for example, by collaborating on disease management teams, through on-site observations of new techniques, by sharing educational resources, by conducting quality and outcomes research, and by working together toward expand access to Memorial Sloan Kettering’s clinical trials. Through these ongoing efforts, HHC will be empowered to learn, adapt to, and adopt Memorial Sloan Kettering standards of care within the context of its own institution and in the context of the communities it serves. Over the next six months, teams from Memorial Sloan Kettering and the Hartford HealthCare Cancer Institute will work collaboratively to assess the resources and capabilities of each of the system’s five acute care hospitals, identifying specific areas of focus. In addition, they will jointly recruit a physician-in-chief of the Hartford HealthCare Cancer Institute who will be on the staff at both Hartford HealthCare and Memorial Sloan Kettering. The two organizations will work over the next few months to integrate Hartford physicians into Memorial Sloan Kettering’s disease management teams. The critical need for such an Alliance can be found in a report recently issued by the Institute of Medicine (IOM) that described the challenge of delivering high-quality cancer care as a national “crisis” and noted advances in treatment may be unavailable to patients who lack access to sophisticated genetic tests or clinical trials. It noted that by 2030 new diagnoses are expected to reach 2.3 million a year as the population ages and that there may not be enough oncology specialists to care for these patients. In addition, doctors are having a hard time keeping up with complex new treatments, and too often decisions about cancer treatments aren’t based on good evidence. Memorial Sloan Kettering and HHC will work collaboratively to measure changes in outcomes including survival rates, quality of life, and total cost of care. HHC and future Alliance members will provide Memorial Sloan Kettering with first-hand knowledge of how cancer advances are practiced in a community setting, where more than 80 percent of cancer patients in the United States receive cancer care. While this approach to bringing truly state-of the-art cancer care to local communities is focused on the rapid application of new knowledge, it does not require building new facilities, thus further providing a cost-effective model for delivering care. After already spending more than a year to develop the structure and plan for the Alliance, both organizations are deeply committed to this initiative and believe this innovative model holds much promise to significantly improve cancer outcomes for patients. “Good cancer care is not just treating cancer — it’s treating your cancer. Likewise, our partnership was designed to adapt and respond to the particular needs of Hartford HealthCare, its clinicians, and its patients—and, together, Memorial Sloan Kettering and HHC can evolve with the ever-changing practice of oncology,” said Dr. Thompson. Read a related story in the Wall Street Journal published today. is Hartford Hospital Sloan Kettering associated with the Sloan Kettering Center in NY? My primary Dr. suggested I contact/see them in NY but would love to stay local instead of traveling. I'm in Somers, CT. Thank you. Dear Michele, thanks so much for your question. 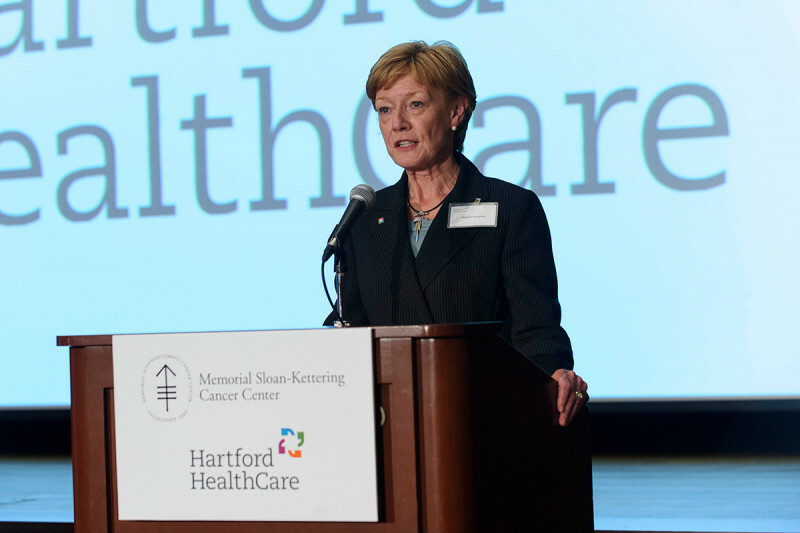 Hartford HealthCare will become the first member of our Cancer Alliance starting in September. The Alliance is an initiative designed to elevate the quality of care delivered at community hospitals. Please keep in mind that MSK and HHC are not sharing patients through the Alliance. In other words, patients of HHC are not patients of MSK. Also, please be aware that the work of the Alliance with Hartford is focused on certain cancer types. Is there additional treatment that can be offered for an otherwise healthy 53-year-old man (my brother who has a wife and three children, high school and college students) who was diagnosed with stage IV stomach cancer in early 2014, was treated with an initial round of chemotherapy in CT, and was accepted into a clinical trial but referred back for radiation due to bleeding of the tumor prior to continuing chemotherapy. Radiation treatment was completed on Thursday, November 6, 2014 and did stop the bleeding. The following Tuesday, November 11th, the doctor said the stomach cancer had metastasized to the liver and nothing else could be done. My brother is suffering. I have received first-hand accounts from many who have been through terrible cancers and told by medical providers of limited survival but they are alive and well many years later. Does my brother have any options for treatment? Thank you. Dear Eileen, we are sorry to hear about your brother’s situation. We can’t offer personal medical advice on the blog, but if he would like to make an appointment to consult with one of our specialists about his treatment options, please call our Physician Referral Service at 800-525-2225. Thank you for reaching out to us.